Fates Warning guitarist Jim Matheos almost worked with Dream Theater's drummer Mike Portnoy once before in a "supergroup" setting, when the idea for Transatlantic was originally being formulated. That didn't come to pass and the guitar duties came to the The Flower Kings' Roine Stolt instead. Fast forward a couple of years and the opportunity for the two men to work together again re-presents itself. This time, the grouping called OSI (or Office Of Strategic Influence) also includes Chroma Key's Kevin Moore on keyboards, vocals and programming (he an ex-cohort of Portnoy's in Dream Theater), along with some notable guests: Sean Malone (Gordian Knot) on bass and stick, and Steven Wilson (Porcupine Tree) for vocals on one track. 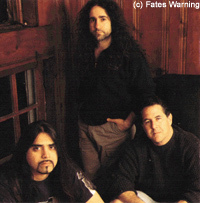 Matheos and Moore are no strangers, as Moore has guested on three Fates Warning albums, including the highly regarded Perfect Symmetry. We spoke recently with Matheos about the new OSI project and their future plans now that the debut album is out, and about what lies ahead for Fates Warning. Jim Matheos: Hello, this is Jim from OSI. Igor Italiani: Hello Jim! Well, finally we are able to do this interview. So first of all let me tell you that it's a real pleasure to talk with such a great musician like yourself. JM: Oh, well, thank you very much. Yes, I had some problems with my schedule, but as you can see now it's all OK. So we can start the interview. II: OK Jim ... so can you tell me when the idea of doing a side project like OSI struck your mind? JM: Well, the honest answer is that doing a project like OSI never entered my mind consciously, it really was kind of ... it developed during a certain period of the year, and it really started off like something completely different. It started off like some kind of side-project for myself and Mike, and in its original form it was more like a straight prog metal album. But you know, when Kevin entered the picture, the whole thing changed. He added a lot of ideas and re-worked old ones, so in the end the songs changed into what OSI is now. But we never had a grand plan like this in the beginning. II: Had you already started to compose some material before this change happened? Is there some leftover piece of music from the recording sessions that will see the light of day sometimes in the future? JM: We actually composed some very long songs in the beginning, and they actually kind of transformed into the tunes that you find on the album right now. In fact, we didn't happen to write a song and then throw it away. It was more about taking the original songs and shaping them with the influence of Kevin. However there are a few bits and pieces of ideas left here and there, but not a lot. I personally have a couple of strong ideas that didn't fit on the album, so they might just end up in the next Fates Warning record? II: But do you think OSI will produce a follow-up sometime in the future, or it will be at least doubtful? JM: Yes, I'm quite sure there will be a sequel. Right now I have a very busy schedule, but I know that somewhere in the future I would love to do another chapter with Kevin and Mike. Kevin expressed deep interest in this thing, too, so I'm pretty confident to say that there will be another record as soon as time allows us to do it. II: Did you expect the good sales reports that the album is receiving? JM: Well, to be honest with you I don't care too much about sales reports, cause it's been a long time since my first days in music and right now I simply don't focus myself on selling records as some others do. The thing that I really crave the most is doing the album, composing and working as hard as you can to produce something relevant. However returning to the selling argument, I knew that OSI would probably do OK, because of the names thrown inside, with Mike and Kevin. But for me the most exiting thing was really to play with such accomplished musicians. II: Jim, talking about Kevin, how is it to record and play with him? JM: Oh it's great. I'm a huge fan of his; I think he is really talented, and I also have to confess that I'm always a bit intimidated when I play in the same room with him. Yes, even at this stage of my career I can be intimidated by someone like him. I think he is a quite imposing figure and I love everything he does. II: Do you think he will be part of the next Fates Warning album? And do you think he'll be playing some live shows in the future? JM: Well, it's hard to say. We are just starting to write the new songs for the next Fates Warning album now, and you know, as much as I love Kevin and his music, I'm a little afraid that his new role with OSI will generate some sort of confusion in the audience. The fact is that I want to keep the two bands separated, so who knows? However Kevin already expressed sincere interest in producing the next Fates Warning album, so he can always fall in that spot, but right now it's just too early to say what will happen. The same thing with concerts, cause Fates Warning have a lot of live material that comes from its early days and which is guitar-driven, while on the other hand the last few albums are more keyboard-driven. So the best choice for us is to find someone who is able to fill in both as keyboard player and guitarist, like Shaun Michaud (of Event) did the last time we played live. It would be a stretch for us to include six members on the stage, so it's hard to say if Kevin will join us for some shows in the future. II: Returning to the OSI album, is it true that this album was mainly composed in the studio, even if the key elements of the band have a lot of other commitments, too? JM: Well, in fact it's not completely true that the album was done in the studio. I wrote 8 or 9 songs here at home, in my studio, then Kevin worked and developed these demos at his home in Costa Rica. So when we got to the studio to record the drums, the songs were already written almost in their entirety. I think we spent 8 to 10 days in the studio rehearsing and coming up with the final versions of the tunes, and this process was quite similar to the one I tend to use with Fates Warning. II: Can you tell me who wrote the lyrics of the songs? JM: Oh it was Kevin who wrote all the lyrics except "ShutDOWN," the song on which Steve Wilson sings. As strange as it may seem I didn't write any lyrics for the album. II: Well, you just mentioned Steve Wilson ... how was important to get him on the album? JM: It was very important for my get list that we had at least a couple of songs with another singer, cause I didn't want the record to go too much into the Chroma Key direction. So that's why I expressed profound interest in having Steve Wilson at least for a song. II: But is it true that you are also thinking about Steven Wilson as producer of the next Fates Warning album? JM: Yes, he expressed a little bit of interest but I don't know if this will happen, because he is not a big fan of the type of music we tend to play with Fates Warning. For example, he thinks that Ray has a great voice, but he simply doesn't love his style. II: Let me tell you that I can't wait to get my hands on the new album ... you know, Fates Warning is my favourite band alongside Kansas! JM: Yeah really? You know what? The original, original singer for OSI would have been Steve Walsh. Believe me, I talked with him when things got started for this album. II: What? You're joking or what? I don't believe it! JM: I swear to you it's true. Unfortunately the thing never materialized because suddenly the music changed direction. But in the beginning it was almost a race between him and Daniel Gildenlow (Pain Of Salvation). In fact, Steve has a copy of the original music back at his home. Probably you will love to hear that he is my favourite singer! So right now, it's hard to say if he still can end up on the next OSI record somewhere, but I would certainly love to work with him in the future. I remember that he called me out of the blue because he knew that I was searching for a singer for this band, and I have to admit that I could hardly talk when I picked up the phone. JM: In fact I've done at least 40 interviews about this project, and this is the first time I mention this in particular. II: So thank you, Jim, for sharing the scoop with us ... OK, so now I would like to ask you something about your beginnings as a musician - what bands influenced your playing? JM: Well, certainly Kansas ... I had two different sides. I liked the prog rock music with bands like Genesis, Jethro Tull, Emerson, Lake and Palmer; but at the same time I enjoyed more heavy stuff like Black Sabbath, U.F.O., Uriah Heep. So I think it was these two sides that melted together and deeply influenced me. II: And now what about another solo record? The last one was absolutely fantastic? JM: Yes, that's our goal, to not repeat ourselves. It's something that is always in the back of my mind. Every time we do a record we always want to do something different and try to challenge ourselves. On the other hand I don't spend too much time focusing on the overall music picture, so it's hard for me to answer you correctly, even if it's true that right now the scene has experienced a bad few years. Unfortunately this situation hurts a band like Fates Warning more than other major acts. II: OK, Jim, so I think that's all. Thank you for the great conversation and I hope to see you in Italy as soon as possible. JM: Thank you to you, Igor. It's been a pleasure to do this interview. So have a nice day and we'll try to come and play in Italy as fast as we can. Bye. Fates Warning will be joining Dream Theater and Queensrÿche on a US tour in Summer 2003 beginning on June 23. Spock's Beard's Nick D'Virgilio will be filling in on drums for Mark Zonder.